214 pages | 2 B/W Illus. Understanding and managing inter-religious relations, particularly between Muslims and Christians, presents a challenge for states around the world. This book investigates legal disputes between religious communities in the world’s largest majority-Muslim, democratic country, Indonesia. It considers how the interaction between state and religion has influenced relations between religious communities in the transition to democracy. The book presents original case studies based on empirical field research of court disputes in West Java, a majority-Muslim province with a history of radical Islam. These include criminal court cases, as well as cases of judicial review, relating to disputes concerning religious education, permits for religious buildings and the crime of blasphemy. The book argues that the democratic law reform process has been influenced by radical Islamists because of the politicization of religion under democracy and the persistence of fears of Christianization. It finds that disputes have been localized through the decentralization of power and exacerbated by the central government’s ambivalent attitude towards radical Islamists who disregard the rule of law. Examining the challenge facing governments to accommodate minorities and manage religious pluralism, the book furthers understanding of state-religion relations in the Muslim world. This accessible and engaging book is of interest to students and scholars of law and society in Southeast Asia, was well as Islam and the state, and the legal regulation of religious diversity. "This book is valuable as a study of the evolving character of extremist Islam in Indonesia, but its more important contribution lies in what it reveals about Indonesian democracy.." - Mark Cammack, Journal of the Humanities and Social Sciences of Southeast Asia (2015) 377-379. 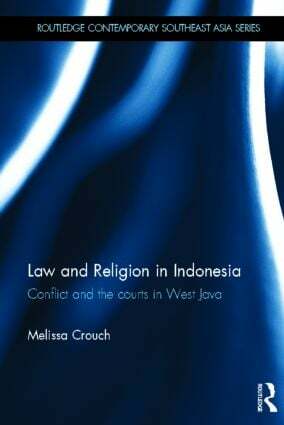 "It is a significant contribution to the discussion on the development of law, democracy, and human rights…Melissa Crouch is right to claim in her abstract that this book will be ‘of interest to students and scholars of law and society in Southeast Asia; Islam and the state: politics of the courts; and the legal regulation of religious diversity’. It is undoubtedly a book deserving of wide readership." - Euis Nurlaelawati, Journal of Islamic Studies. "This book is a significant contribution to the study of law and religion in Indonesia […] For Crouch, while democracy has opened greater avenues for both Muslim and Christian communities to assert their democratic rights and advocate their respective interests, it has also cultivated religious majoritarianism at the expense of minority rights. […] one striking feature of the book…is the three case studies. All of these case studies are creatively derived from the broader theme of proselytization that is at the heart of the book. […] Crouch demonstrates from these three case studies that courts in Indonesia are still grappling with deeply rooted problems that have continued throughout and beyond the democratic transition." Dian A. H. Shah, International Journal of Constitutional Law (2018) 16(2). Melissa Crouch is Postdoctoral Fellow in the Law Faculty at the National University of Singapore. Her research focuses on law and religion, Islamic law, legal anthropology, and public law.